Starting from the randomly initialized population the evolution tries to stepwise increase the average performance values. Parallel activity of robot and software during the evolution. A series of 12 consecutive time steps with the motion detection difference images underneath. 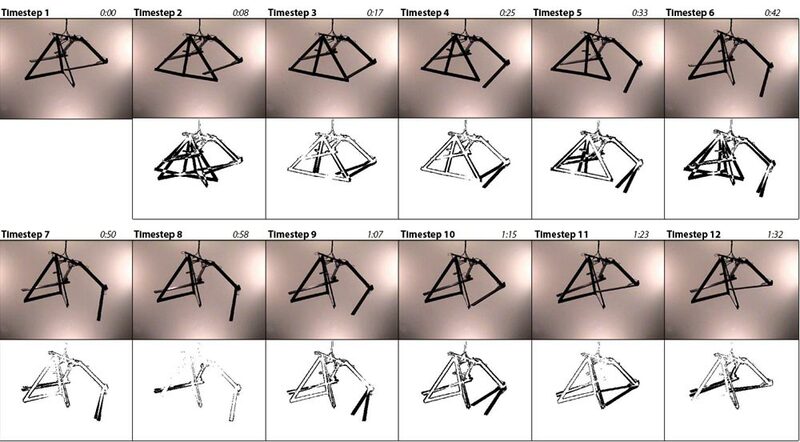 The embodied evolutionary process that slowly adapts a robot's motion pattern can be visualized as a cyclic flow of data between several components. The software, that connects the individual parts, starts the iterated procedure by selecting a parent patterns out of a pool of motion patterns. 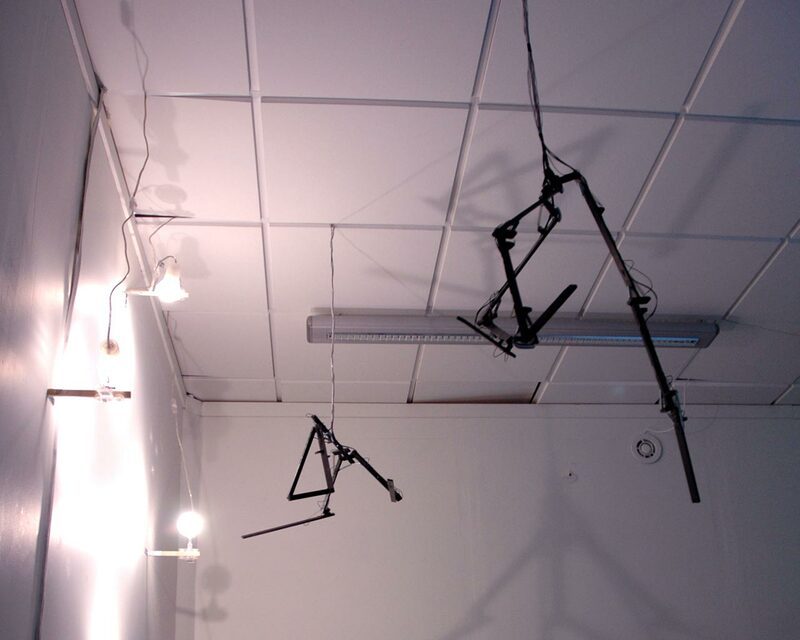 The cloned and modified offspring pattern is downloaded onto the Arduino platform and its execution causes the activation of the robot's muscle elements. The dynamic motion behavior, that is the product of the activation pattern, the robot's hardware and environmental conditions, is monitored by the camera. The software captures images from the camera and analyzes them according to specific fitness criteria. The resulting fitness is then assigned to the pattern and used in the decision whether the pattern is successful enough to replace a weaker member of the pattern population. After the survival selection, the software routine restarts to handle a new motion pattern. The evolutionary run continues autonomously until it is terminated by the human supervisor based subjective reasons. Every evolutionary run starts with the initialization of its start population. 10 individual motion patterns are generated and their parameters are set randomly with a Gaussian distribution operator. A steady state evolution has an offspring population size of 1. Every new successful pattern is immediately included in the parent population. Reproduction solely based on asexual operators is carried out by cloning a parent pattern and mutating its parameters. The software chooses one parent among the population by using a rank-proportional selection mechanism. The mutation operators are responsible for exploiting the possible search space by producing slight variations of successful patterns. After evaluating its performance the steady state evolution adds the new pattern to the parent population. Offspring and parents compete with each other for survival as the population size has to be reduced to its fixed value of 10. In a simple truncation action the pattern with the weakest fitness value is extracted from the ranked population. The fitness value that determines the future of every motion pattern is the sum of several weighted fitness functions. The motion value indicates the degree of the pattern's visible physical movements by applying a motion detection operator to the captured image sequence. A positive weight steers the evolution towards more and more articulated motion patterns. The motion continuity value judges each time steps activity in comparison to the whole cycle's average motion. This allows identifying smooth and continuous movements from abrupt and jerky ones. The energy usage value is determined by adding up the the heating time in seconds for each individual spring element during one activation cycle. By weighing it negatively the evolution tries to create efficient motion patterns that achieve high fitness while employing less energy. The cycle time value is included into the fitness evaluation to allow additional influence on the time character of evolved patterns. By weighing it negatively the evolution can be steered towrads faster motion loops.